As I arrived in Nice France for my last few days in Europe it was getting towards dusk. 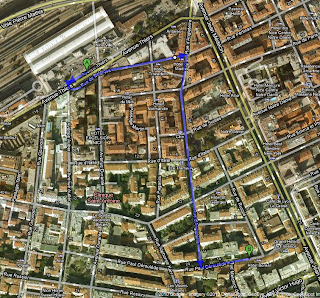 I collected my belongings and walked away from the Gare de Nice-Ville. In my month long stay in Europe I had learned that the further you are away from the train station, the quieter your night will be. So with that in mind, I walked away from the train station. I had no reservations anywhere or even an idea of where I might find lodging for the night. As I walked, the light of the day gave way to shadows. It was becoming difficult to read street names or numbers. I was unsure that the part of Nice where I walked would have street lamps, nor when they would illuminate my way. I walked another block or two and saw no hôtels. I remembered I had seen one within one block of the Gare de Nice-Ville, but nervously held out for, as I said to myself: "just another block or two, before turning back". On I walked and just as the dark made it impossible to see, I came across a banner, hanging from a building, bearing the words: Hôtel Athena. Remember that, if you ever are in Nice. As I arrived at the front door of the Hôtel, they were just locking up for the night. As they saw I was a customer, the door was unlocked and I dragged myself into the front room. I can't call it the lobby. It was much too small. I dragged out my French phrase book, started to speak, when the lady at the front desk, asked me in English what I wanted. I said a room for the night and that they had. I asked to see the room and the landlord gave me a key. I dragged my bag up to this room. It had windows facing the street, but they were closed. It had a queen size bed. It was firm. That was the only bed I slept in throughout Europe that had a firm mattress. I went back downstairs, and gave the lady my passport and money. She made to leave when I stopped her and asked where I might find a salade Niçoise. At this she perked up a little and gave me some directions down to the Place Masséna, where, I was informed a Salade Niçoise could be had. Along with a nice glass of rosé, please. So, off I darted, and the hôtel staff was forced to wait up for my return. Which, when I returned I found that they had all gone to bed. At the Place Masséna, which is a walking street, there were a number of restaurants. And most were already closed. But one, exactly in the middle of the pedestrian walkway was open. And they had a salad for me. But no rosé. So I had a glass of red wine. And walked back to the hôtel I was full and happy. And I had the best night's sleep I had in a month. In the morning, I opened the windows. The sunlight was beautiful, the air was clear and sweet smelling and I was elated to have found such nice lodging at such a reasonable price. I came downstairs, found coffee, croissants, and jelly. I ate so much that I surprised mine host. I thanked her for the help and she asked when I was leaving. I said that I was taking the night train to Paris (my 2nd to last day in Europe). She said I could see the Antiques Market, but her tone was one of sadness for me. She really wanted me to see the flower market. A last word about this woman. I believe she owned the building. The hôtel. She was mid-to-late 50s. Blonde. Stocky, but in an attractive way. She is bourgeois in the best sense of the word. A real gem of a Frenchwoman. I'm sorry I didn't have more time to talk to her. Down to the Cours Selaya I went and had a wonderful time looking at the antiques. As I walked along I found a bakery where I had slice of pissaladière Niçoise. Unfortunately they heated it in a microwave oven. I also found a strange little shop. The owner roasted coffee in it. The aroma was overpowering and good. Other than coffee, he only had oregano, of which I purchase one bag. It has an extraordinary aroma. It is like Mexican oregano, but with a half-note of mint added. So, that was my day in Nice as it's worth reporting. My night consisted of eating a socca. I will have to give a recipe for socca in another post. 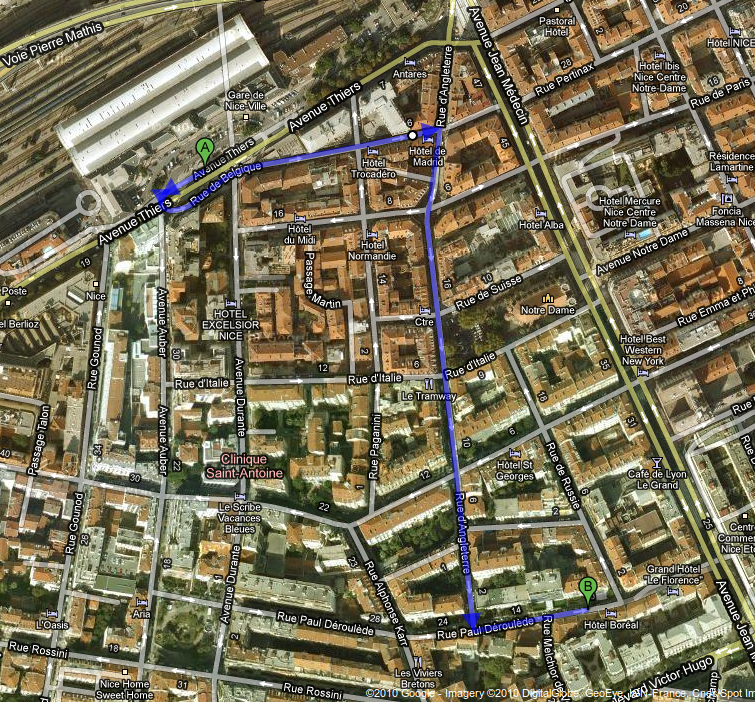 I walked back up the Cours Selaya and the street changed it's name to Rue Saint-François de Paule. Along it I saw the mill of Nicolas Alziari. An ancient shop of all things olive. From wooden tools made of the olive tree to the oil itself. Sadly, for me, it was closed. I would call it a must see in Nice. Later, while still wandering on foot, I found someone selling olives, the picholine and walked and ate them. I wandered in and out of the Casinos, the beaches and another pedestrian shopping area. My way of touristing is to grab a bus and go. It doesn't matter which direction or where. So, using that technique, I found my way to the old port of Nice. And as the bus rounded the sharpest right turn I have ever had the discomfort to be a part of; out the window I saw a home wine and perfume making shop. I grabbed the stop-bell-rope for dear life, and 2 blocks later I had the chance to walk back to this place. I won't tell you where it is. It's not that I'm mean I just have no use to see that place commercialized. They had wooden casks and barrels for aging wines, and stills for making perfumes, and labels for your olive oil bottles, just in case you pressed your own olive oil. And yes, they had the presses, too! Ah! I could truly die a happy death at that place. 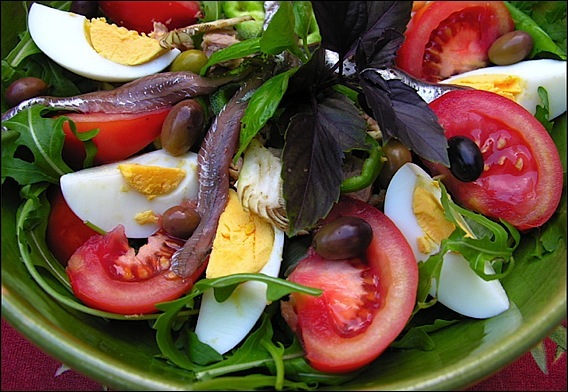 All recipes for the Salade Niçoise are flexible. This site give an excellent, if exalted recipe. I don't like the artichokes. And if someone else gave a recipe using red potatoes, that I would find fault with as well. Yet, there must be some same ingredients in each one that give the name of the dish it's meaning. Those must be: tuna fish, niçoise olives, tomatoes, cucumber and anchovies. Other than that, your choice of lettuces are yours. As well as the type of cucumber. As Persian cucumbers have become widely available in Hollywood (where I live), I prefer them to all other cucumbers. There is a spelling error in the recipe link. Where, in the ingredient list it calls for: 10 feuilles de basilicfacultatif, that should read: basilic facultatif. "RECETTE SALADE NICOISE - Fleuron du patrimoine culinaire du Comté de Nice, la SALADE NIÇOISE est présente sur les tables des restaurants dans les cinq continents, mais que de crimes (de goût) ne commet-on pas en son nom!" The SALADE NICOISE - Flagship of the culinary culture of the County of Nice, the SALADE NIÇOISE is served at restaurant tables on five continents. But of the crimes (of taste) we will not comment on in [the salad's name].